Typewriters became obsolete. Therefore, oil will follow a sunset script too. This logic may seem disjointed and even a little pithy, but there are parallels that run far deeper than you may think. Typewriters evolved into the new world of word processors. Can oil companies transform themselves, evolving their processes and products into the new world of competitive energy systems, lower commodity prices, and lower carbon emissions? In fact, it’s already happening. Progressive oil and gas companies are improving their products and processes. But first, let me tell you a story about an oil company that used to make typewriters. 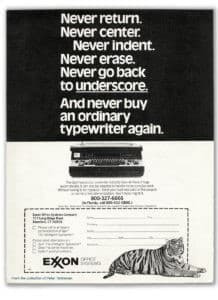 Yes, an oil company once did make typewriters, none other than Exxon Office Systems. The multinational oil giant decided to venture into the business of manufacturing words in the mid-1970s, during the unsettled era of oil price shocks. Back then, much like today, environmental regulations were pressuring the business. Nuclear power was viewed a disruptive threat. So, maybe Exxon’s strategy to go outside the oil arena was a defensive reflex. Maybe. 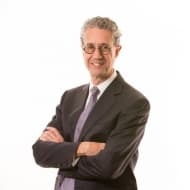 But more likely, getting into non-core ventures was a sign of the times, an era when corporate diversification and conglomeration were in vogue. Exxon’s Qyx “intelligent typewriter” was a bridge from mechanical keys to the “office automation” model we know of today as word processing. Earth shaking advertising for the Qyx heralded amazing computerized editing features as well as playback from memory at 300 words-per-minute. The Qyx couldn’t compete with the likes of the IBM Selectric, and the emergence of personal computers, dot-matrix printers and software like WordStar. By 1981, the New York Times reported the layoff of 2,000 workers—a third of Exxon’s Office Systems’ staff. In 1984, after reportedly losing a billion dollars overall, the Washington Post wrote the eulogy for Exxon’s failed venture. “Don’t invest in businesses and markets you know nothing about,” is the obvious MBA lecture here. But I think that’s a superficial message. The real strategy lesson to be had from Qyx is in recognizing how products and processes evolve through innovation. Oil and gas companies are in the business of delivering energy. It’s old news that everything from batteries, to wind turbines and solar panels are wreaking the forces of “disruption” and “transition” on our energy supplies. But many don’t realize that progressive oil and gas producers are dynamically innovating and transforming the supply-side structure of the market too. Typewriters became word processors through a 15-year evolution of process and product innovation. At the end of the transition, words were being produced more efficiently and accurately than ever before. And all from the same QWERTY keyboard (though not necessarily of better literary quality). The successful oil and gas company that transitions into the 2020s will look nothing like it does today. Leading companies in North America are championing efficient manufacturing-type processes in the field, aided by data science, delivering greater quantities of energy at progressively lower cost. But what of delivering a better product? Are all hydrocarbon-derived barrels, molecules and electrons not the same? By definition, raw energy products like oil, gas and electricity are energy “commodities”, suggesting minimal differentiation. Yet that’s not true; for example, wide disparities between producers of oil can be identified. Today, and in the future, delivering a better energy product will mean supplying a lower carbon consumable to meet pressing environmental challenges such as climate change. Minimizing water usage and toxic emissions are other, equally important dimensions of product differentiation. Manufacturing words more efficiently was aided by the digital sciences. Similarly, a long list of technologies—be it blockchain, robots, 3D printing, machine learning or artificial intelligence—are aiding the transition to greater digitization in oil and gas. Result: greater efficiencies that reduce costs and environmental impacts out of the hydrocarbon supply chain. Many companies large and small are getting on board. Shell’s company ambition, for example, “is to reduce the net carbon footprint of the energy products Shell sells by 20 percent by 2035…,” and by 50 percent by 2050. Achieving any sense of sustainability is an urgent matter. To do it in any meaningful timeframe requires that established hydrocarbon systems are typed into the storyline of our global energy transition. By corollary, oil and gas companies that don’t embrace the future of energy will be typed out of the transitional script. And like the mechanical typewriter their demise will be very Qyk. Will Lithium-Air Batteries Ever Become Viable?